This new and incredible experience will take you beyond the simple observation of a volcano. Live a unique Volcanology Experience together with the Geologist and Volcanologist Mr. Gino Gonzalez one of the most experienced volcanologists of the region. 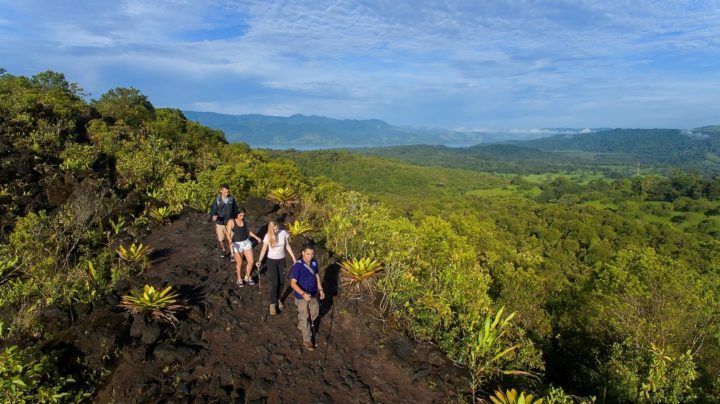 The tour will begin with a visit to the pyroclastic cones and active faults, where you will be able to study them closely, as well as the historical lava flows of the Arenal Volcano National Park of 1968, the recent pyroclastic flows and waves and the hot springs coming from the volcano. In addition, you can also visit the historical sites, La Fortuna Waterfall, where the ancient eruptions of the Chato Volcano are located. You will have also the opportunity to make experiments with rocks in order to know the volcano, as well as collecting samples, among others activities. After this unique experience, you will start seeing volcanoes in a completely different way. Excursion Includes: Lunch in a local restaurant. Inclusions: Two glasses of wine and hot hors d’oeuvres. The previous night to the activity, an expert volcanologist will visit you at your hotel and will provide a lecture about general aspects of volcanology and the Arenal Volcano, the perfect introduction for your next day experience. The volcanologist and geologist, Gino Gonzalez, studied at the geology at the Universidad de Costa Rica. Thanks to his good grades and his attitude, he was also taking into consideration by the volcanologist Raúl Mora for helping him in his expeditions, in this job he acquired a lot of experience that helped him grow and learn about the volcanoes. His first descent was made in 2008 to the Poás Volcano. Later he became one of the members of a Commission Specialized in Volcanoes. Years after, he became a professor at the Universidad de Costa Rica and now he directs the organization Volcanes sin Fronteras, a non-governmental organization dedicated to the study of volcanoes and the dissemination of knowledge to the population in general.